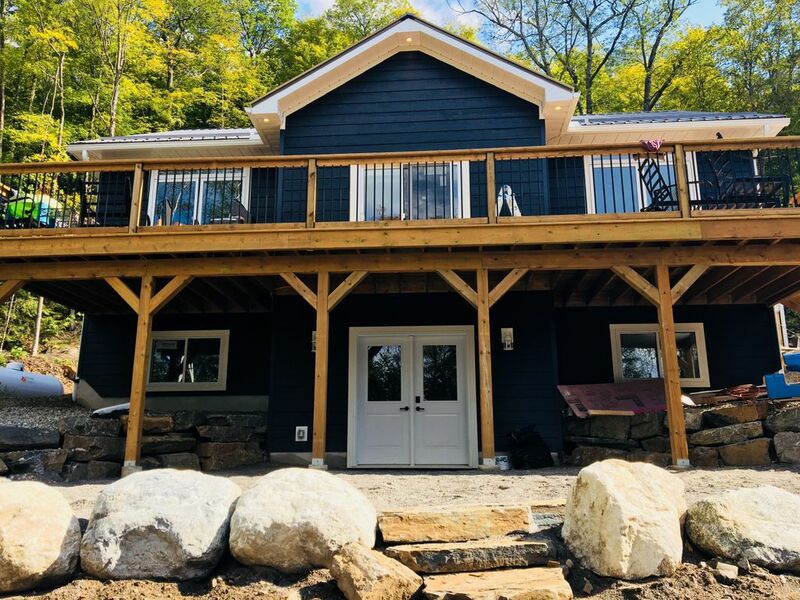 Newly custom built, 4-season waterfront Cottage on 20 acres in beautiful "Land O Lakes". The cottage sits on a crystal-clear, spring-fed lake about 5 km in length. Palmerston lake offers excellent fishing for smallmouth bass as well as lake trout and pan fish. Our lake system is extreamly clean, weed free and excellent for swimming, boating, fishing and more. The space-Spacious, open kitchen comes complete with granite countertops, stainless steel appliances and everything you need to create memorable meals. 5 large bedrooms with new pillow top mattresses for a restful sleep. 2 full bathrooms, one per floor. Everything you need to relax: boardgames, flatscreen TV, canoe, kayak, propane fireplace, large outdoor fire-pit, internet, large dock and crystal clear water with depts of 6ft off the dock. Local boat rental and launch nearby. The best Atv trails in the province are less than 1km away from the property.